We all want something in life. We want to become better people. We want to have nice possessions. We want to experience new things. The art of setting goals helps us get from where we are now to where life’s prizes wait. Like other art forms, however, achieving a goal takes effort, practice, technique, and the right equipment. 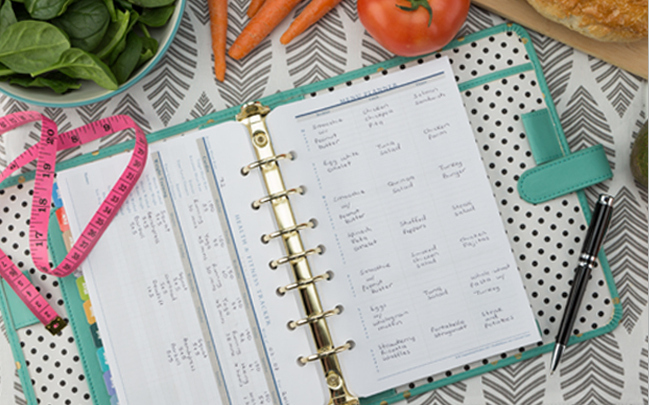 Your FranklinPlanner has several sections to help support your goals, from the first desire for change to the victory lap. The answers to these questions are the first step toward creating a framework for your goals, a schematic for your life. As you answer these questions, you can combine your reflective insights into a personal mission statement. Once you have developed this personal mission statement, write it down and keep it at the front of your planner. Many FranklinPlanner users decorate a Dashboard (Link to Planner Love Dashboard) with their mission statements, and place it so that it’s the first page they see when they open their binder. Once you’ve defined your values, you can use a Goal Planning Form to map out the steps needed for each of your goals. Each Goal Planning Form gives you space to set deadlines for each step along the way, whether you’re improving your running times for a marathon, reaching word count milestones in your novel, or executing a new marketing strategy. Sometimes it’s hard to see beyond next week, let alone plan for next year. However, many of life’s most enriching goals, like developing musical talent or becoming a better parent, require consistency for weeks, months, and years at a time. As you set your goals, use your Future Planning Pages in the back of your planner to mark off long-term milestones related to your goal. Whether you’re marking each color of belt on your journey to black belt or planning a live performance for 2017, understanding the big picture gives perspective to the daily grind. The loftiest dreams will never come true without daily effort. Whether it’s practicing the piano, eating healthy, or spending less, small changes each day can add up to big improvement. Many planners have a Daily Tracker section to remind you of these small steps, but even if you simply record it in your list of daily tasks, the act of writing it down and crossing it off each day helps solidify your focus on your goals. At the end of each month, review the progress that you’ve made. In your Monthly Index, give yourself a score for the things that you’re tracking daily, and identify what happened on the days when you slipped up. A monthly accountability check is a great time to fine-tune your goals, and prepare for the next month. Your planner is a means unto an end: growth and development in your personal, professional, and social life. Take advantage of all the tools it has to offer, and you’ll make lasting positive changes in your life.